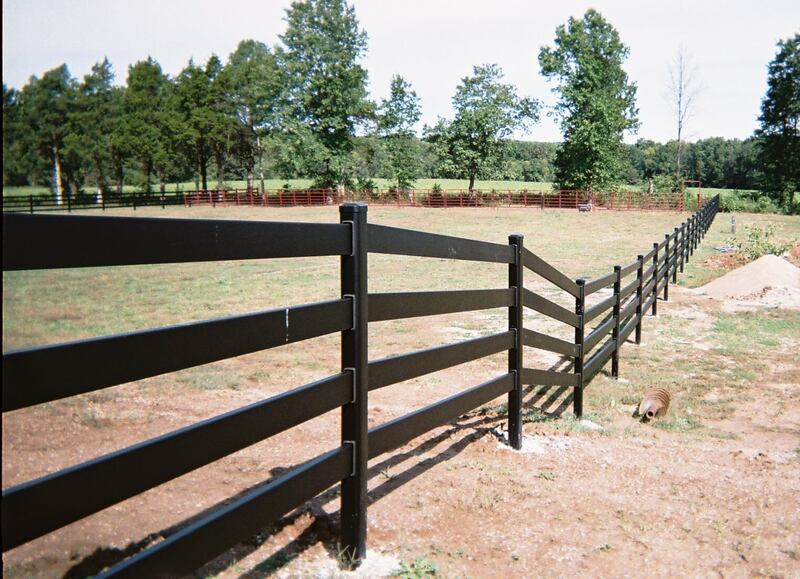 “If the only horse fence I ever install again is the Buckley Steel Board Fence, that will be just fine with me,” says Brian LeQuesne, owner of B&M Fence Company, Inc. in Kansasville, WI (www.bmfencecompany.com). “You could not make or buy a better fence for horses,” he said. Brian first learned about Buckley Fence from a relative who had obtained information on the Steel Board Fence from the Buckley Fence website and asked Brian to install it. It was love at first installation! 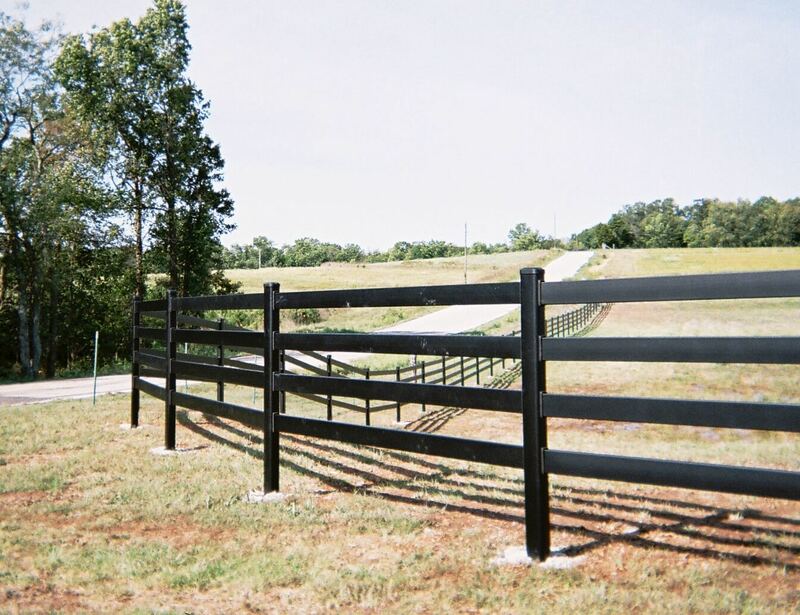 Steel Board Fence in black with a rounded corner. The most recent installation of the Steel Board Fence done by Brian was his third. The scope of the project included approximately 2,700 linear feet of 4-rail Steel Board Fence and 11 Steel Board Gates on a property owned by polo enthusiasts with 15 polo ponies. Their need for horse fencing was urgent since they were replacing old, post and wire rail fencing that was becoming a danger to their horses. 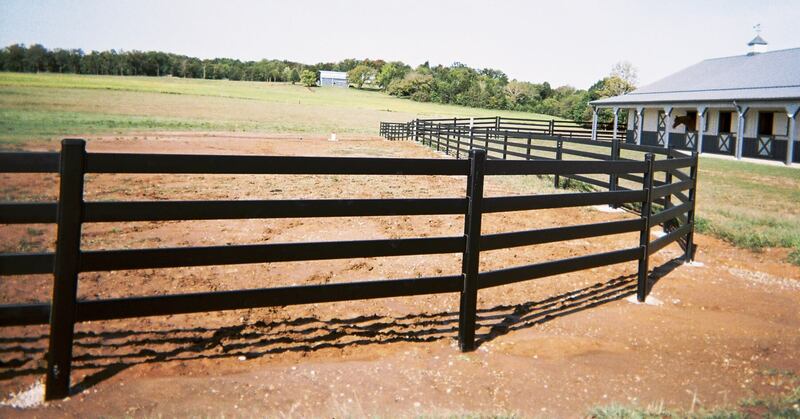 After doing an extensive search for horse fencing best suited for their needs, the property owners selected the Steel Board Fence for a number of reasons. First, it was a strong, safe and durable horse fence solution that was going to require very little maintenance. Second, were the matching Steel Board Gates. Since their layout called for numerous horse gates, it was important a well designed horse gate made in multiple sizes be part of the fencing solution. Third was horse fencing in black. The textured black powder coat finish on the Steel Board Fence was not going to require repainting nor would it fade, and it looked beautiful. After visiting with another Steel Board Fence customer, seeing the fence installed, and hearing how well the fence has performed with horses, the decision was made to go with the Buckley Steel Board Fence. All that remained was finding the best fence installer for the project. In came Brian from B&M Fence, who came highly recommended by Buckley Fence. Following the contour of the land is accomplished easily with the Steel Board Fence. We interviewed Brian to learn more about his experience with Buckley Fence and the Steel Board Fence in particular. Below is a summary of the questions and his answers. Q. How was your experience working with Buckley Fence in regards to fulfilling orders, coordinating pick-up or delivery and condition of the product? A. It was all as expected; accurate, prompt and very well packaged. Q. Did you find the detailed gate and fence installation instructions helpful? A. They were user-friendly and I was thankful to have them since many other fence providers have none. Steel Board Gate with the gate post set in core drilled concrete. Q. What was your biggest challenge installing the fence? A. The biggest part of the job is digging the holes for the posts. At a depth of 43 inches, the Steel Board posts are deeper than posts for the weaker plastic and wood alternatives and that puts them well below freeze line. It makes perfect sense. I think it’s a good design feature that makes the fence that much stronger and with the 10 foot centers, there are 20% fewer posts than the typical 8 foot centers. Top view of the Steel Board Fence line ending at a 3-way post. Q. Overall, would you rate the installation process easy, difficult or somewhere in between? A. Despite the depth of the posts, I think the fence is easy to install. With a crew of three, we set 800 linear feet of posts per day (approximately 83 posts on 10 foot centers per day). We used wet mix concrete to set each post which is the only way to go as far as getting a solid anchor for the post. The straight fence line of the Steel Board Fence is impressive. Q. What was your impression of the finished installation? What was your customer’s impression? A. The finished installation was top of the line. It looks as beautiful and it is strong and my customer loves it. You cannot get a better fence! 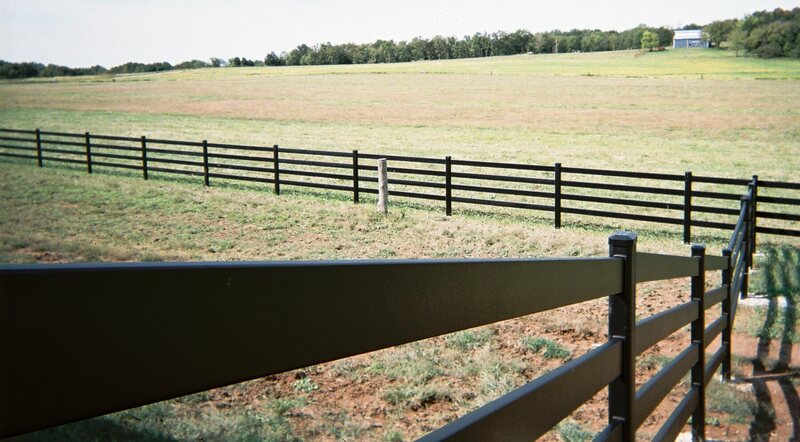 The Steel Board Fence in black makes a beautiful perimeter fence. For a safe and strong horse fence that will provide years of service and enhance a property’s value, contact us today at 877-306-4024. For more information, visit our website at www.buckleyfence.com or email us at sales@buckleyfence.com.